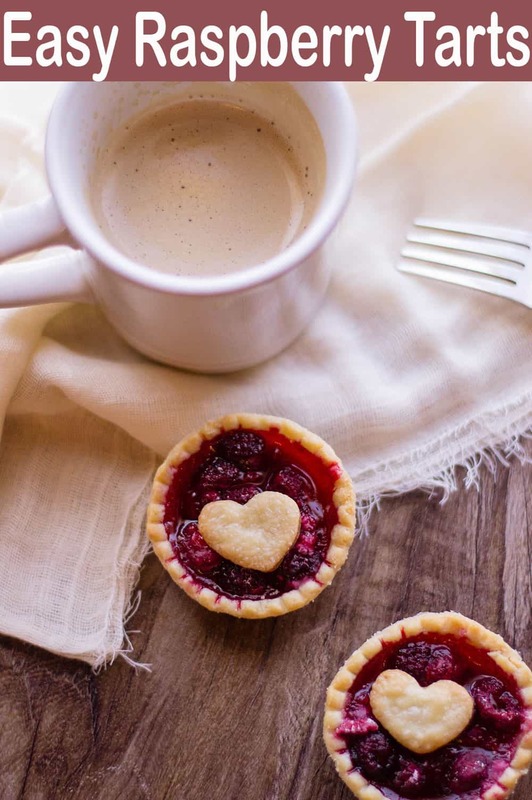 These wonderfully adorable Easy Raspberry Tarts are mouthwatering and so simple to make! If you’re looking for a dessert to impress your guests at your next dinner party but don’t want to spend all day baking, check out this recipe. The flaky crust and juicy raspberries will have your guests reaching for a second tart! 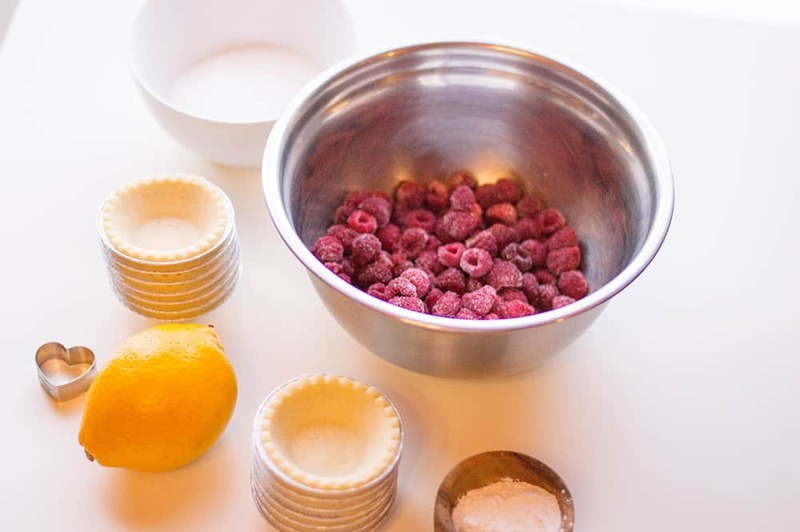 Easy Raspberry Tarts may look like you’ve spent a lot of time on them… but they require little effort. A win-win! WHY BAKE WITH FROZEN FRUIT? When certain fruits are out of season, you may be better off buying them frozen. Since they are picked at the peak of ripeness before being frozen, they’ll taste better than the out-of-season fruit. Raspberries are in season in the summertime, so if you want to make this recipe in the winter, it’s perfect! Frozen fruit also tends to cost less than its fresh fruit counterparts, and if you’re baking a large quantity, this definitely matters. Unless you’re eating the fruit fresh, using frozen fruit won’t matter as much when you’re baking. Step #1: Preheat oven to 350 degrees and place 12 of your mini pie shells on a baking sheet. Tip: If the mini pie shells are frozen, be sure to thaw them for about 15 minutes. Step #2: Place frozen raspberries in a large bowl and mix in lemon juice. Then, coat the raspberry mixture with sugar and cornstarch. Next, scoop into your mini pies without overfilling them. Step #3: Bake for 20 to 25 minutes or until crust is golden. Cool on a rack. Step #4: Take your spare mini pie shells and roll it on a smooth surface, just enough to make it flat but keep its shape and size. Cut out small hearts with the help of a cookie cutter. Place on your baking sheet and bake for 10 minutes. 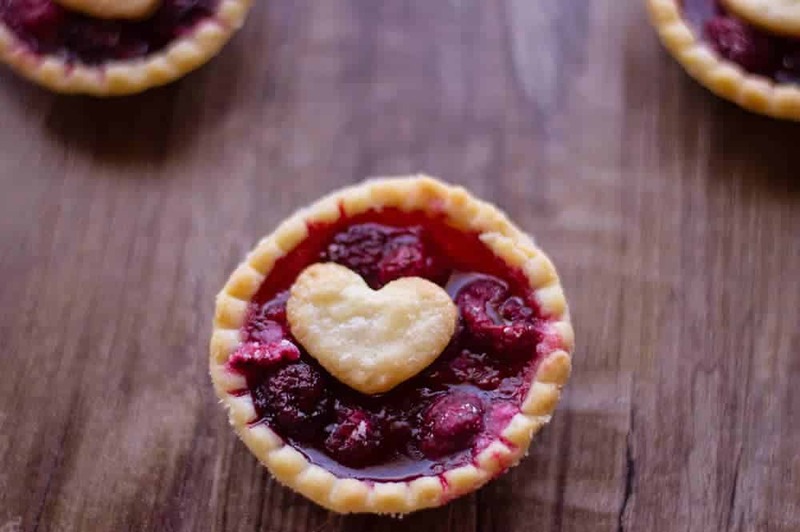 Step #5: Once heart crusts are baked, place in the center of your Easy Raspberry Tarts and allow to cool. Aren’t these just the best? Easy to make, full of sweetened raspberry goodness, and cute as a button. Desserts don’t get much better than this! This raspberry tart is beautiful and simple to make! Preheat oven to 350 degrees and place 12 of your mini pie shells on a baking sheet. (If pie shells are frozen, be sure to thaw them for about 15 minutes.) 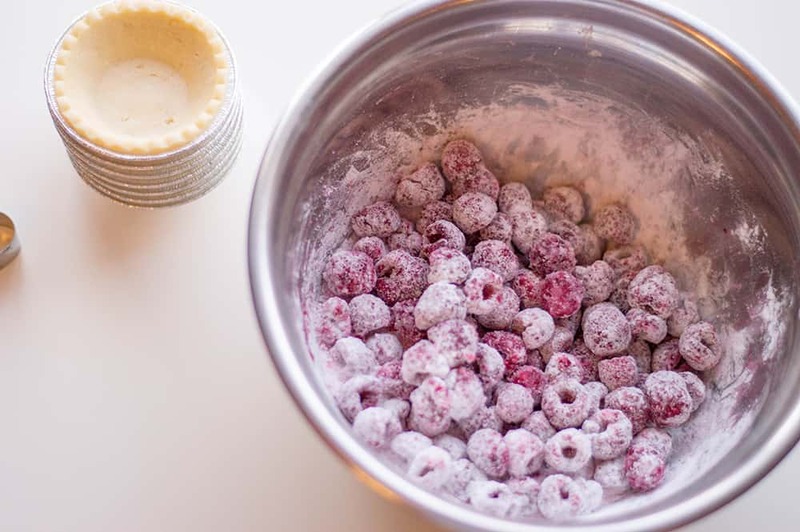 Place frozen raspberries in a large bowl and mix in lemon juice. Then, coat the raspberry mixture with sugar and cornstarch. Scoop into your mini pies without overfilling them. Bake for 20 to 25 minutes or until crust is golden. Cool on a rack. 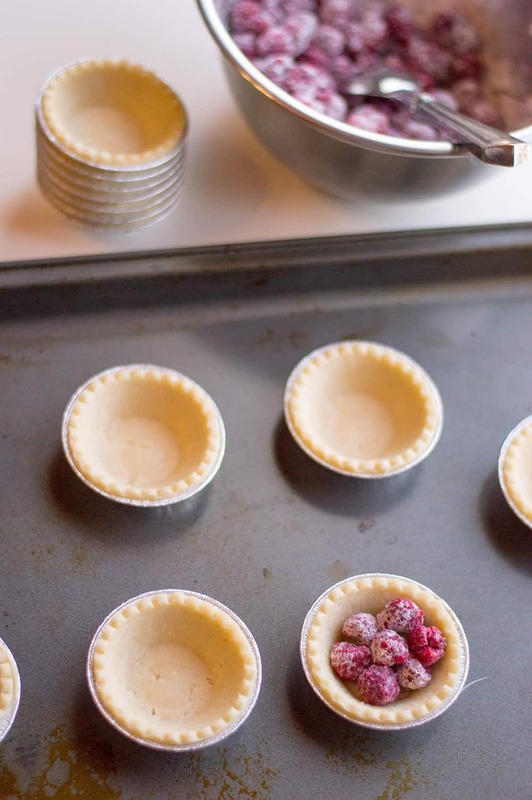 Take your spare mini pie shells and roll it on a smooth surface, just enough to make it flat but keep its shape and size. Cut out small hearts with the help of a cookie cutter. Place on your baking sheet and bake for 10 minutes. 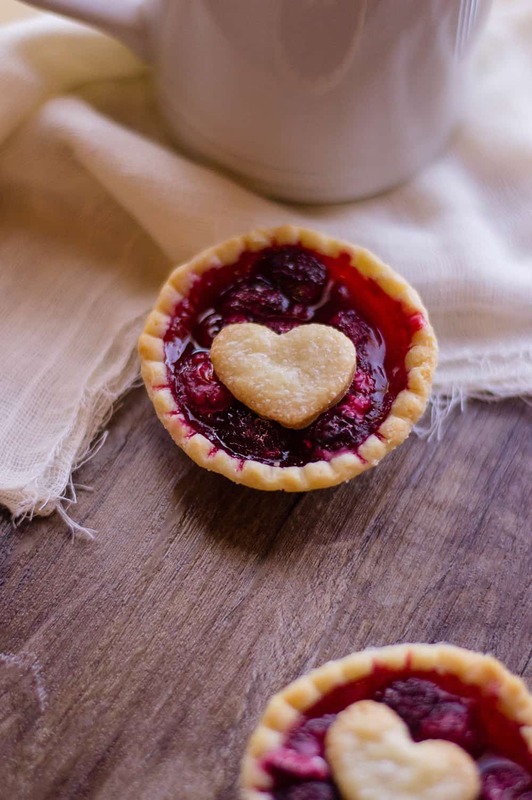 Once heart crusts are baked, place in the center of your tarts and allow to cool.